Jarrett Design is grateful for repeat clients, especially when they have impeccable taste. In this case, we started with their guest bath. An antique-inspired, hand-pegged vanity from our Nest collection, in hand-planed quarter-sawn cherry with metal capped feet, sets the tone. 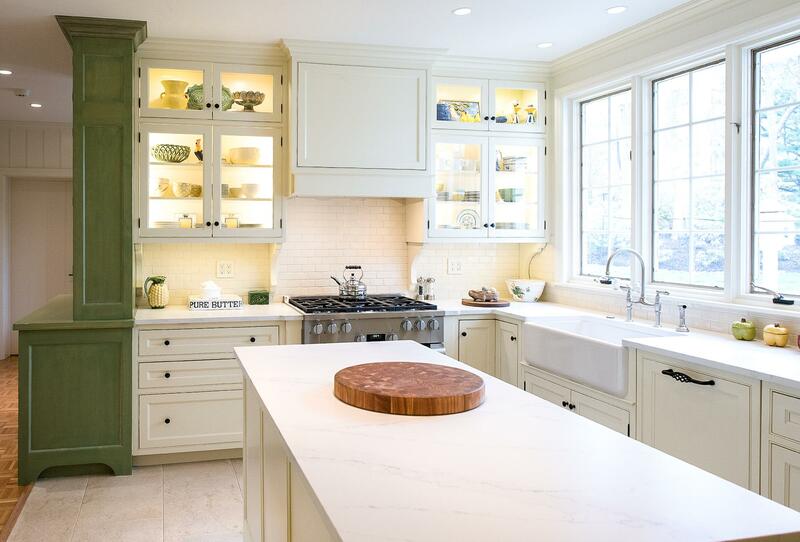 Calcutta Gold marble warms the room while being complimented by a white marble top and traditional backsplash. 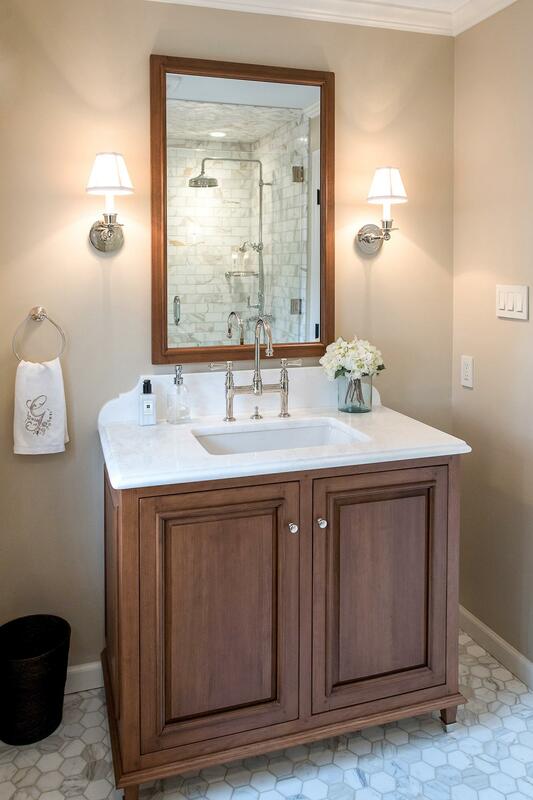 Polished nickel fixtures, lighting, and hardware selected by the client add elegance. A special bathroom for special guests. Next on the list were the laundry area, bar and fireplace. The laundry area greets those who enter through the casual back foyer of the home. It also backs up to the kitchen and breakfast nook. The clients wanted this area to be as beautiful as the other areas of the home and the visible washer and dryer were detracting from their vision. They also were hoping to allow this area to serve double duty as a buffet when they were entertaining. So, the decision was made to hide the washer and dryer with pocket doors. 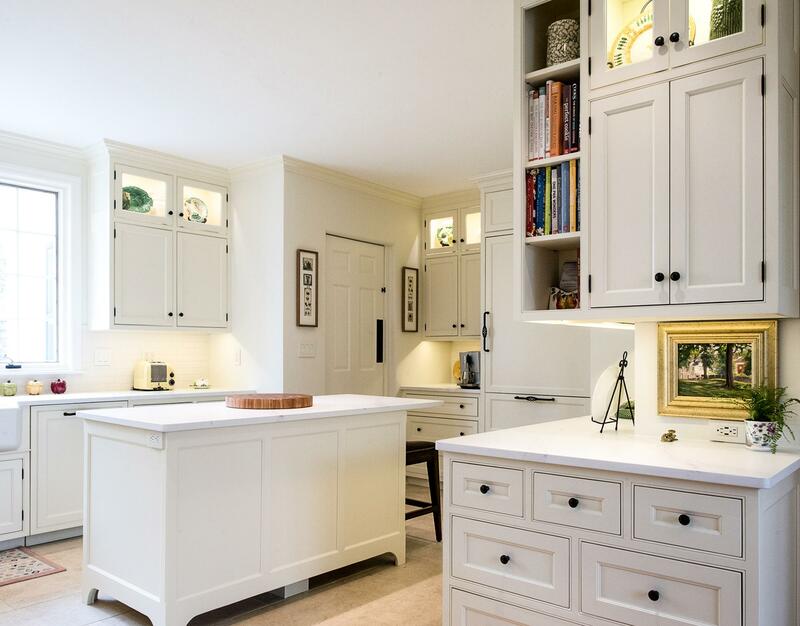 The new cabinetry had to match the existing wall cabinets in style and finish, which is no small task. Our Nest artist came to the rescue. 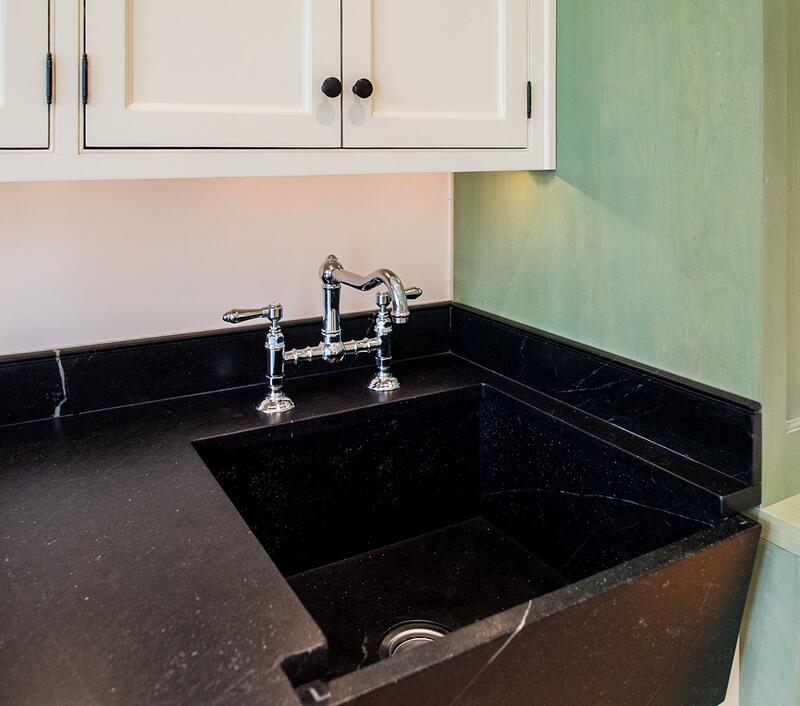 A five-piece soapstone sink and distressed counter top complete the space with a nod to the past. Our clients wished to add a beverage refrigerator to the existing bar. The wall cabinets were kept in place again. 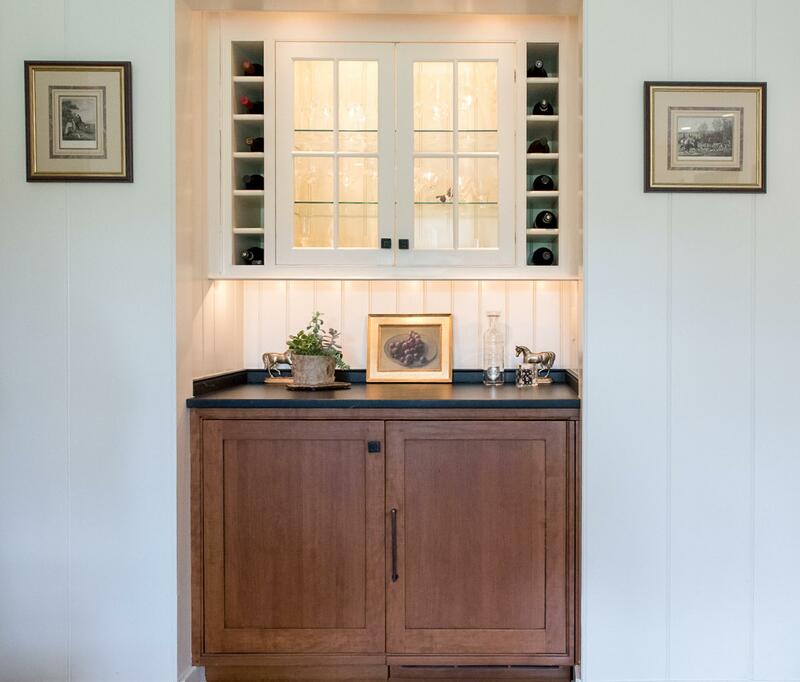 Inspired by a beloved antique corner cupboard also in this sitting room, we decided to use stained cabinetry for the base and refrigerator panel. 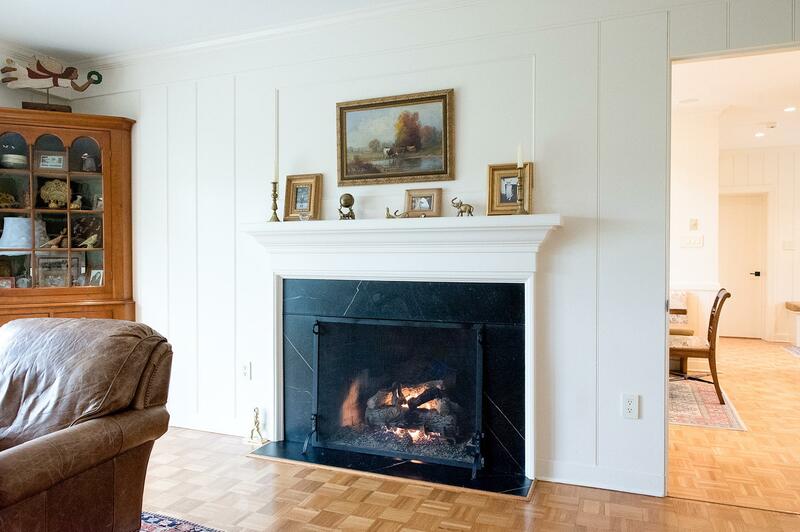 Soapstone was used for the top and new fireplace surround, bringing continuity from the nearby back foyer. Last, but definitely not least, the kitchen, banquette and powder room were addressed. 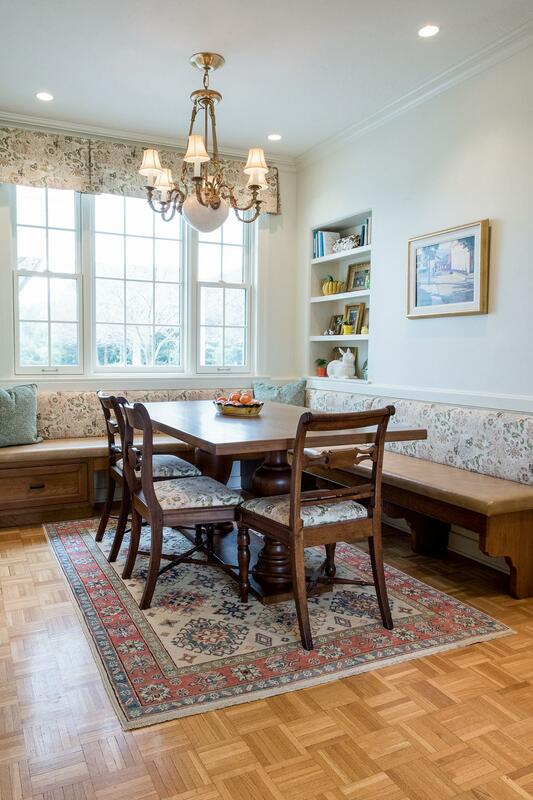 The clients removed a glass door in lieu of a wide window to create a cozy breakfast nook featuring a Nest banquette base and table. Brackets for the bench were designed in keeping with the traditional details of the home. A handy drawer was incorporated. The double vase pedestal table with breadboard ends seats six comfortably. 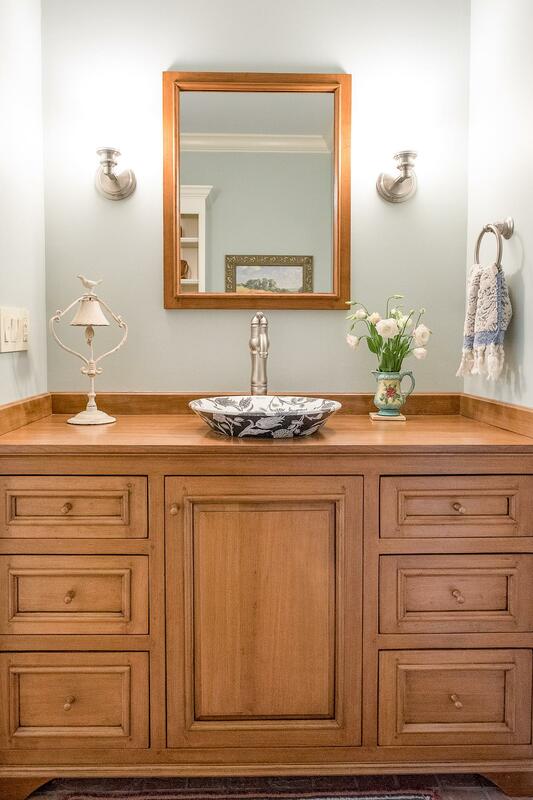 The powder room was updated with another antique reproduction vanity and beautiful vessel sink. While the kitchen was beautifully done, it was showing its age and functional improvements were desired. 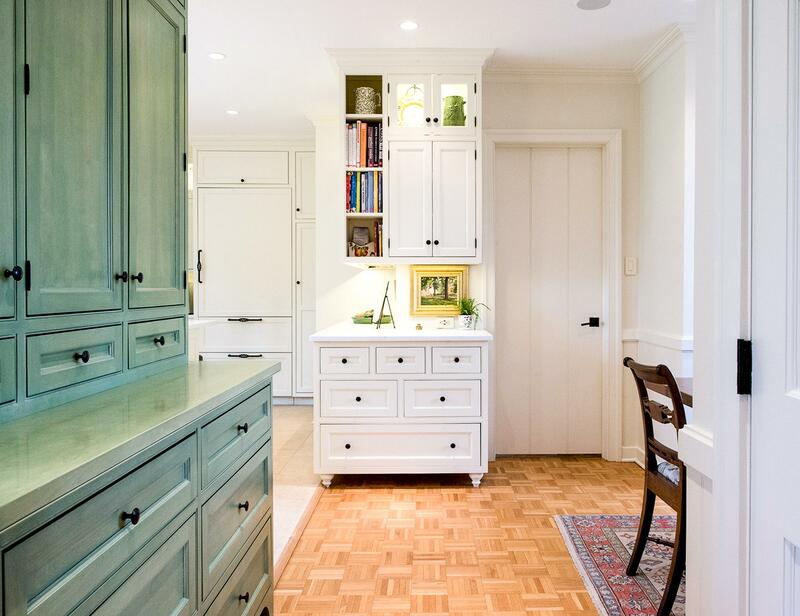 This room, like the laundry room, was a project that included existing cabinetry mixed with matching new cabinetry. Precision was necessary. For better function and flow, the cooking surface was relocated from the island to the side wall. 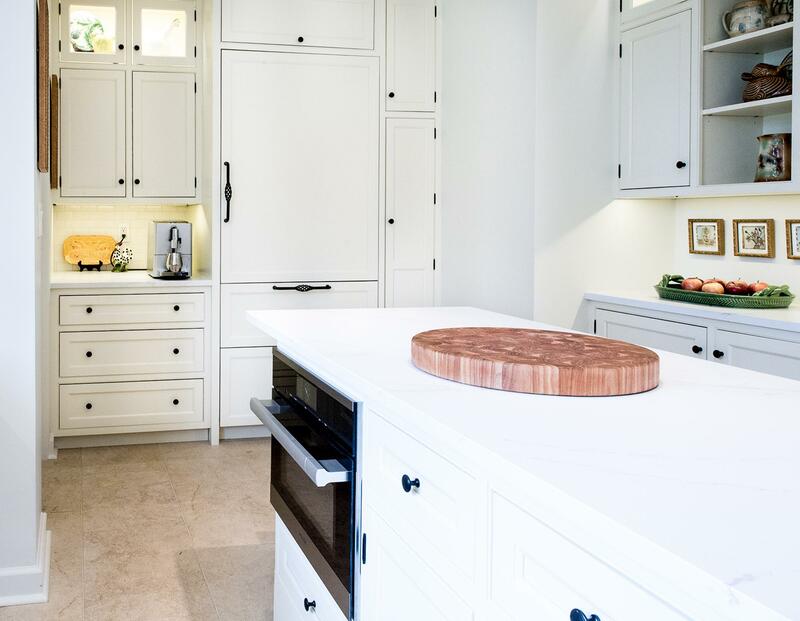 Instead of a cooktop with separate wall ovens, the clients opted for a pro style range. 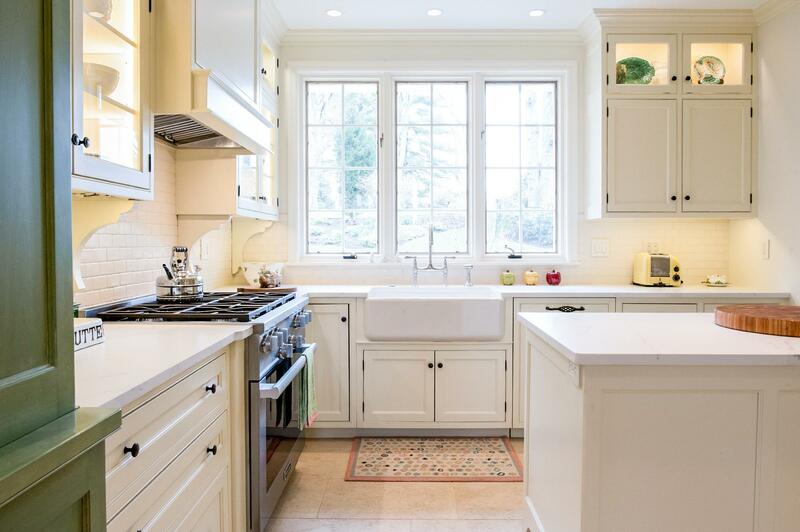 These design changes not only make prepping and cooking in the space much more enjoyable, but also allow for a wood hood flanked by bracketed glass cabinets to act a gorgeous focal point. Other changes included removing a small desk in lieu of a dresser style counter height base cabinet. This provided improved counter space and storage. The new island gave better storage, uninterrupted counter space and a perch for the cook or company. Calacatta Gold quartz tops are complimented by a natural limestone floor. 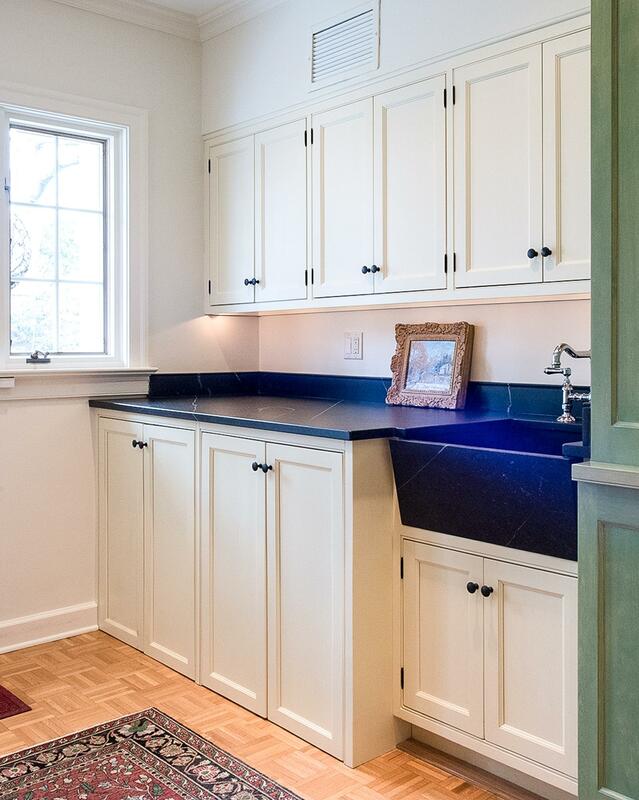 A classic apron sink and faucet along with thoughtful cabinetry details are the icing on the cake. Don’t miss the clients’ fabulous collection of serving and display pieces! We told you they have impeccable taste!